Home / Where in the World Is Erica Cherry? Those students who have traveled on a YOBC International Tour before, or are going to Spain this summer, already know that being involved in music can take you to great places! This June I am headed on my own musical adventure; I have been selected as one of the 2018 Teaching Artists to teach clarinet at El Sistema, El Salvador for two weeks, as part of the MusAid Teaching Artist Residency. 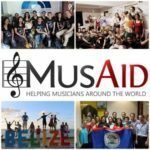 MusAid is a nonprofit “that connects musicians across the globe through educational exchanges designed to inspire individual and community transformations.” Basically, the MusAid team supports socially driven programs around the world by sending and training young professionals to perform and educate. Being a musician (especially a young musician!) means more than taking lessons and being able to execute your scales, exercises, and repertoire – it also means being socially and globally aware of the powers of music. Think about everything that has to happen to make you a great musician – you need access to wonderful teachers, books, bows, reeds and materials, skilled instrument technicians, the list goes on! MusAid works to fill some of these gaps in programs around the world. 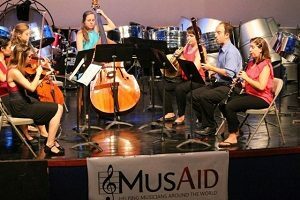 Since 2008, MusAid has supported music schools and orchestras in Kyrgyzstan, Laos, Burma, Haiti, Bolivia, and the Philippines. In 2015, I was lucky enough to travel to Belize, where I taught private lessons, group classes, pedagogy classes, and performed alongside students in the orchestra. I loved my time working with the National Youth Orchestra of Belize, and there were lots of similarities to YOBC, including great music-making, motivated students, and a love of snack time. In this year’s program in El Salvador, I will be teaching, performing, and developing my group-teaching skills along with six other fellows (you can check out everyone’s bios here. Most of the other selected Teaching Artists are active performers who have experience with private teaching, private youth orchestra programs (like YOBC), or El Sistema programs. Our host program is El Sistema, El Salvador, which provides young people with resources to become responsible musicians and citizens. I will have the chance to work with the students of this program as well as the faculty. I’ll be performing a chamber music concert with the other fellows, as well as an orchestral concert with the whole program. In addition to teaching private lessons, I’ll be leading orchestra sectionals and teaching master classes and workshops on a variety of topics. I’ll be one of only two wind instrumentalists there, so I’m curious to see how it goes! We will have some time off to explore the city and the area, as well. I can’t wait to come home and tell our YOBC community all about it! Erica Cherry is YOBC’s Operations Manager and Woodwinds Sectional Coach. After her trip to El Salvador, Erica will accompany the YOBC Tour Ensemble to Andalusia, Spain.